O God, who crowned with the gift of true faith Saint Elizabeth Ann Seton's burning zeal to find you, grant by her intercession and example that we may always seek you with diligent love and find you in daily service with sincere faith. Through our Lord Jesus Christ, your Son, who lives and reigns with you in the unity of the Holy Spirit, one God, for ever and ever. Spirituality for Widows | Ronda Chervin Ph.D.
Born in New York, Elizabeth Seton married and became a mother of five children. After her husband's death, she converted to Catholicism and founded the American Sisters of Charity, a community of teaching sisters which began Catholic schools throughout the United States, especially helping with the education of underprivileged children. 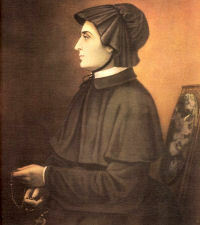 Mother Seton laid the foundation of the American parochial school system and was the first native-born American to be canonized. Elizabeth Seton was born on August 28, 1774, of a wealthy and distinguished Episcopalian family. She was baptized in the Episcopal faith and was a faithful adherent of the Episcopal Church until her conversion to Catholicism. She established her first Catholic school in Baltimore in 1808; in 1809, she established a religious community in Emmitsburg, Maryland. After seeing the expansion of her small community of teaching sisters to New York and as far as St. Loius, she died on January 4, 1821, and was declared a saint by Pope Paul VI on September 14, 1975. She is the first native born American to be canonized a saint. This wife, mother and foundress of a religious congregation was born Elizabeth Ann Bayley on August 28, 1774 in New York City, the daughter of an eminent physician and professor at what is now Columbia University. Brought up as an Episcopalian, she received an excellent education, and from her early years she manifested an unusual concern for the poor. In 1794 Elizabeth married William Seton, with whom she had five children. The loss of their fortune so affected William's health that in 1803 Elizabeth and William went to stay with Catholic friends at Livorno, Italy. William died six weeks after their arrival, and when Elizabeth returned to New York City some six months later, she was already a convinced Catholic. She met with stern opposition from her Episcopalian friends but was received into full communion with the Catholic Church on March 4, 1805. Abandoned by her friends and relatives, Elizabeth was invited by the superior of the Sulpicians in Baltimore to found a school for girls in that city. The school prospered, and eventually the Sulpician superior, with the approval of Bishop Carroll, gave Elizabeth and her assistants a rule of life. They were also permitted to make religious profession and to wear a religious habit. In 1809 Elizabeth moved her young community to Emmitsburg, Maryland, where she adopted as a rule of life an adaptation of the rule observed by the Sisters of Charity, founded by St. Vincent de Paul. Although she did not neglect the ministry to the poor, and especially to Negroes, she actually laid the foundation for what became the American parochial school system. She trained teachers and prepared textbooks for use in the schools; she also opened orphanages in Philadelphia and New York City. She died at Emmitsburg on January 4, 1821, was beatified by Pope John XXIII in 1963, and was canonized by Pope Paul VI in 1975. Patron: Death of children; in-law problems; loss of parents; opposition of Church authorities; people ridiculed for their piety; Diocese of Shreveport, Louisiana; widows. Meditate on these words of St. Elizabeth Ann Seton, "What was the first rule of our dear Savior's life? You know it was to do His Father's will. Well, then, the first end I propose in our daily work is to do the will of God; secondly to do it in the manner He wills; and thirdly, to do it because it is His willl. I know what is His will by those who direct me; whatever they bid me do, if it is ever so small in itself, is the will of God for me. Then, do it in the manner He wills it."